The 2018 Carolina-Clemson Football Game Giveaway is closed for this year. 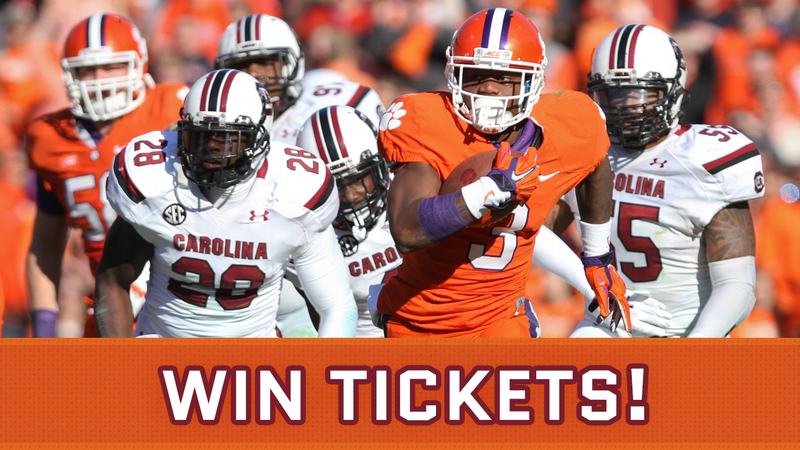 Be sure to check Facebook, Twitter and Instagram often for more giveaways throughout this year’s Palmetto Series. Prizes include tickets, merchandise and autographed sports equipment. The drawings will take place Thursday, November 15, 2018. Winners will be notified by email - please also check spam/junk mail. If contact cannot be made, or if the winner fails to acknowledge winning status within 24 hours, another winner will be selected. No substitutions or exchanges for prizes. Entrants may only enter online. One entry per person. No purchase or transaction necessary. Odds of winning are subject to the number of entries received. Employees and immediate family of the University of South Carolina and Clemson University Athletic Departments, SC Department of Agriculture and Chernoff Newman are not eligible. Entrants must be 18 years of age or older. The University of South Carolina and Clemson University Athletic Departments, SC Department of Agriculture and Chernoff Newman reserve the right to retain and use collected personal information and images for marketing purposes.